Boxes are 2.2CuFT each, L slot port made it in my buddys wood shop. I think they turned out pretty nice. Next time I do them, I'll try and shape them to the trunk as I've got lots of useless space currently. I recently put a chunk of foam insulation underneath the 13x41" sheet that the two boxes mount to, to cut down on the setup bouncing over bumps. Waiting for my M1A amp to show up, then I'll see if I can find some place in Edmonton to tell me my SPL level for free, lol. Last edited by sheptard; 07-25-2010 at 08:19 AM. Looks good. The only thing that I would change is getting a bit more port area out of the box. What is it curently tuned to? Port area is way too small. I'd have almost doubled it. Otherwise, they look good. 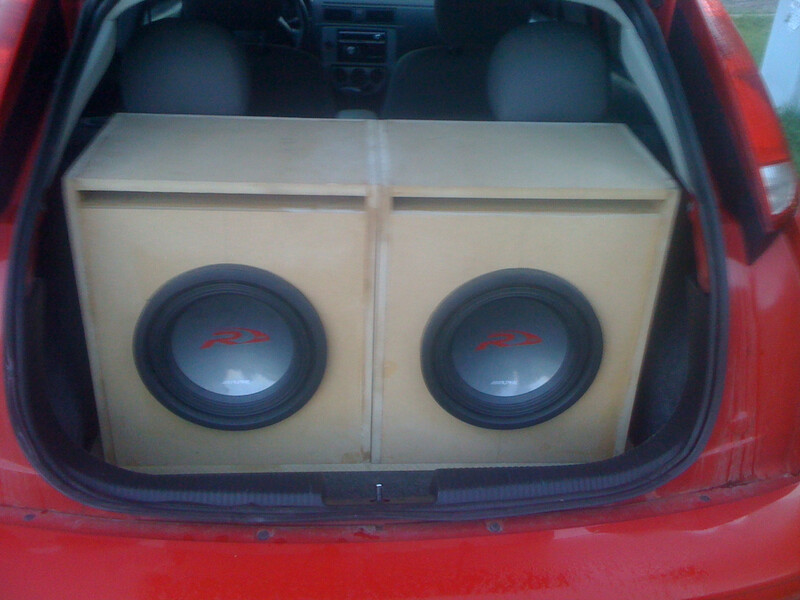 That box is more around 2 cubic feet @ 34.7 HZ. Without the first port length, the box is 20*19*13.5 = 2.248 cf3, minus the second port length (2*6.5*17.5 = 227.5 cubic inches) = 0.131655093 cubic feet. Minus sub displacement (.05 cf3) = 2.066344907 cf3. ... which is either 34.67 HZ (port width 1.25") or 29.926 HZ (port width 17.5") depending on if the port length calculator wanted 1.25" as the height or the width and vice versa for the other port dimension. 21.875 square inches of port area divided by 2.066344907 cf3 = 10.58 square inches of port area per cubic foot. Last edited by Lord Huggington; 07-25-2010 at 07:10 PM. Some of this might be wrong... when calculating any angled port, you have to calculate port length by the "center line" of the port, not based on the length of the inner port walls... as soon as you bend it the length changes. I didn't know that, however I think it remains the same. Port length is 13.5" - .75" MDF = 12.75" - .675" (half of 1.25") = 12.075" + (6.5"+.675") = 19.25"
I think I was supposed to calculate for the inner .75" MDF angle on both of those, which is 20" port length. I always had better luck firing everything up in my zx3. Costly Exotics-just a band-aid for a poor install?